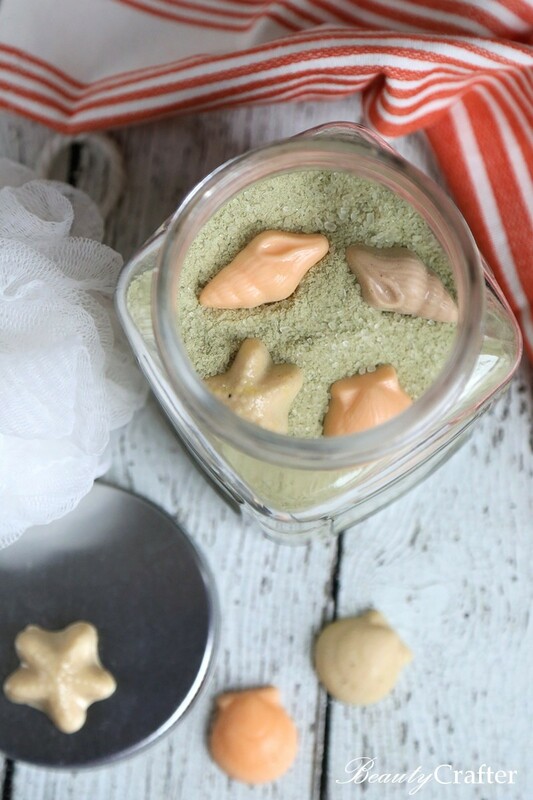 I have summer on the mind, and this Green Tea Lemongrass Beach Sand Bath Salts recipe is the result of that mindset. 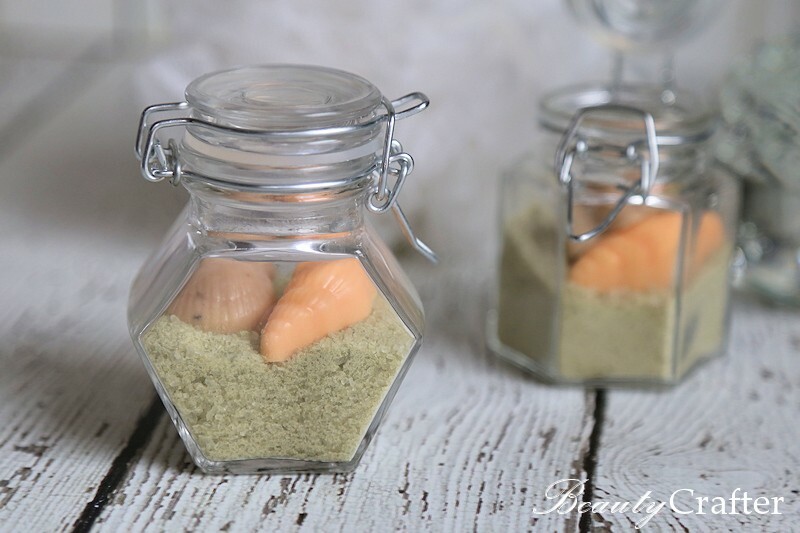 Despite the Green Tea & Lemongrass bath salts having a very subtle tinge of green, the appearance and texture reminded me so much of sand I made little soap shells to accompany the bath salts in the container. The scent of the bath salts while dry is mostly of fresh lemongrass, but as they go into warm bathwater a subtle complement of green tea enhances the fragrance. The little shell soaps are simply melt & pour goat’s milk soap cast in a chocolate seashell mold. 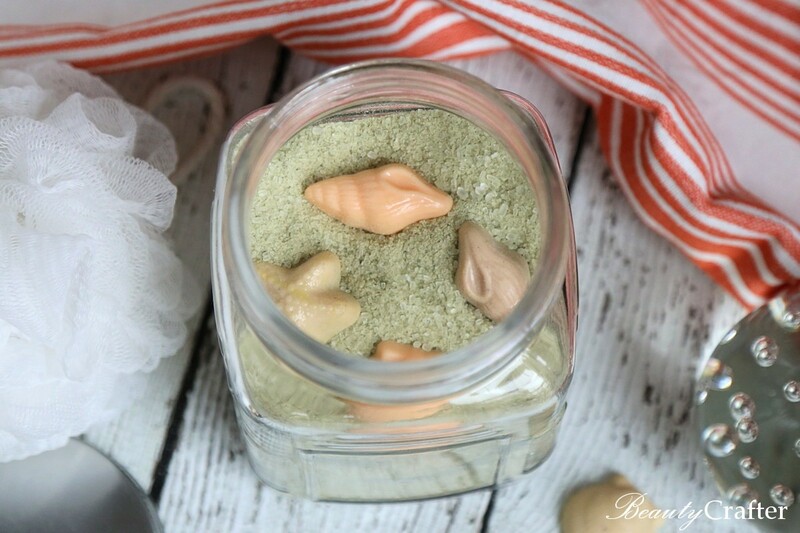 These beach sand bath salts would also make great party or wedding favors. I put a 1/4 cup of the bath salts along with two of the small sea shell soaps in small jars. This is just enough for one bath. I think they would look even better in small wide top round bottles with a cork and a bit of sisal tied around the neck. Here is the simple bath salts recipe. General directions on making the shells can be found below. Simply mix the ingredients together thoroughly. 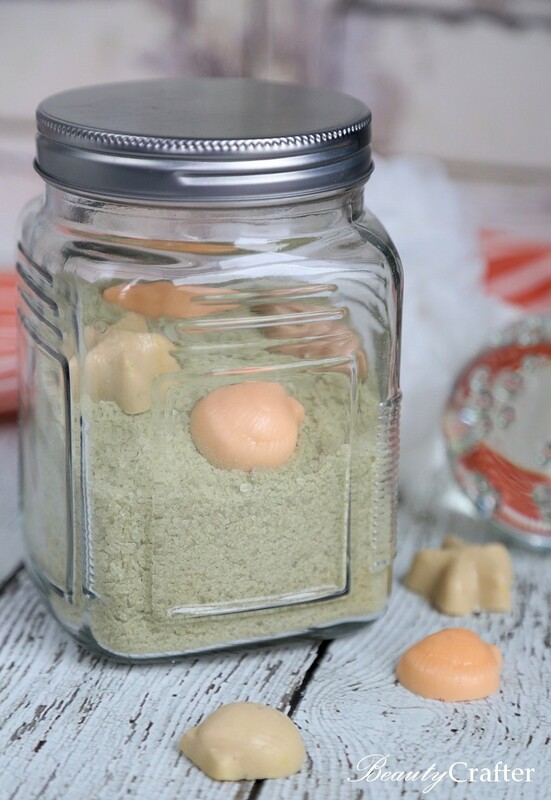 Fill an airtight jar about half full and top off with the homemade sea shell soaps. Melt 1/3 to 1/2 of the soap tint with the gel food dye to make a peach tone. Pour a few shells, then add a little more soap along and a light sprinkle of cocoa powder, melt and pour a few shells in that tone, then added just more soap and make the final shells. Allow to cool, then pop out of the mold and place in jar with bath salts. Sorry, the directions for these are a bit vague. I didn’t measure and with using just a small amount of soap, the main thing to keep in mind is a tiny bit of tint will do a lot.